You can safely and easily make your baby’s food with little time and effort. Homemade baby food is the healthiest alternative to using commercial baby foods and the end result is a tasty array of foods that you just cannot get when using commercial jars. Contrary to some beliefs, making homemade baby food is very safe when you follow a few simple procedures. One of the things that the baby food companies do have that you won’t be able to access is the tools for industrial sterilization and cleansing. This does not mean that you cannot guard against food borne pathogens or other unwanted items in your homemade baby food. Here are a few simple and relatively quick things that you can do to ensure your baby food is safe. Always be sure to thoroughly wash your hands. Yes, it seems so common- sensical ; we just wanted to remind you. Make sure that any tools or areas you use such as countertops, utensils, pots and pans, cutting boards and blender/food processors are thoroughly cleaned; preferably with an anti-bacterial soap (using a natural anti-bacterial soap is a fine option for those opposed to commercial cleansers). Never use the same cutting board for meats and fruits/vegetables. You should have a cutting board solely for meat preparation and a cutting board solely for vegetable/fruit preparation. Always be sure to thoroughly wash and cleanse the fruits and vegetables that you will be using to make your baby food. Even if you are not using the peels or skins, and even if you buy organic, you should always cleanse the produce. Peeling skins, and pitting or removing the seeds is important prior to cooking. There are however instances when you do not need to peel, pit or remove seeds; these instances will vary according to your baby’s age, the fruit/vegetable that you are cooking and way in which you will be cooking the food item. Using a wooden cutting board is safer than plastic. It has been shown that bacteria is easier to cleanse/remove from wooden cutting boards. When preparing and/or handling Meats, you should always have clean hands or use plastic gloves whenever possible. If you are going to be moving from preparing meats to preparing another food item, always wash your hands prior to handling the next food. Always wash your hands after handling meats, specifically after handling poultry products – including eggs. 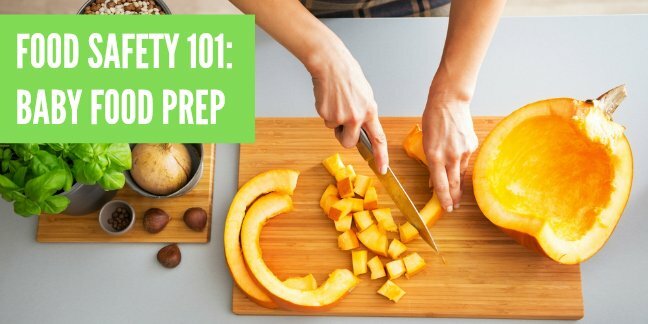 Do no use the same prep surfaces or the same utensils that have been, or will be, used for your fruits or vegetables. Using a wooden cutting board is safer than plastic. It has been shown that bacteria is easier to cleanse/remove from wooden cutting boards. Always thaw meats in the refrigerator or the microwave and never on the counter. Never give an infant raw or semi-cooked meats, poultry, fish and eggs. In other words, babies and even toddlers need their meats “Well-Done”. Cook all red meats to an internal temperature of at least 160° Fahrenheit. Check the temperature with a meat thermometer. Cook white meat poultry to an internal temperature of at least 170° Fahrenheit and dark meat poultry to an internal temperature of at least 180° Fahrenheit for doneness. Check the temperature with a meat thermometer. Cook fish to an internal temperature of 160° Fahrenheit. Check the temperature with a meat thermometer. Leaving foods out on the counter or at room temperature: Do not leave uncooked or even cooked foods out on the counter at room temperature for longer than 2 hours. Frozen foods should not be allowed to thaw and then be re-frozen without first being cooked. Frozen foods should remain at a temperature of 0 degrees or lower. Cooked and prepared foods for baby should be kept in the refrigerator for no longer than 48-72 hours before they are used or frozen.